Art + Flea Holidaze in Chinatown! Come check out the last Art + Flea event of the year! I’ll be sharing a table with Pena People and friends! Last minute shopping WOOT! Kailua Night Market showcases diverse cultural and food offerings and welcome visitors to the Kailua District. I’ll have a booth front and center with greeting cards, stickers, buttons and more! See you there! I’ll be running the marathon today! Wish me luck! Art + Flea for the first time in Kapolei! Come check out some new work and an amazing light installation on the lawn! Join me on the Kokohead exit in Kaimuki as I paint the powerboxes on the corner, I’ll be there Saturday and Sunday! Cheers! We are out of here! I’ll return your call/email when I get back! Ciao! Amazing article written by my beautiful and talented former sutdent! Mahalo Keegan! Hawaii Watercolor society is hosting a tiny art show at Marks Garage and it opens tonight! I have a brand new piece in there so be sure to stop by and check it out! Private event but wish me luck! I’ll be doing some live mural painting and have some stickers for sale at Art +Flea’s South Shore Market! Come check it out and do a little mural painting yourself! Zine Fest at the Manifest! Got a few little pieces in this show! Go check it out! Closing Party at Marks Garage! Last hurrah for “The Finch will Flourish!” See you there! Born from the community support generated at the May 10th Hawaii FEAST, Boz Shurr cultivated the June exhibition, The Finch Will Flourish to focus on transforming public and private spaces into places that feel safe and inviting. This current show At Marks Garage is in collaboration with Hawaii FEAST to benefit Child & Family Service, which provides safe spaces for transitioning, women, children and families. In celebrating the Hawaii FEAST two week run of, The Finch Will Flourish Exhibition, we will be hosting a FEAST and Film Screening Closing pARTy of the award winning film, Janey Makes A Play, a multigenerational story which follows a captivating 90-year-old woman named Janey as she rallies her small town to create a theatre production about the Great Depression amidst the real erosion of the town’s local economy. Seemingly from a very far off place, this film shares the importance of multigenerational relationships while supporting and valueing artistic enterprises and endeavors community while facing and healing some of our biggest collective challenges today. The filmmakers and characters have recently appeared on NPR and CW6. The Hollywood Reporter called Janey an “irrepressible star” and San Diego Magazine deemed the film “funny and heartwarming.” Theater audiences across the country have fallen in love with this inspiring story of growing older with pizazz. It’s a powerful story of community involvement to share with the whole neighborhood. Follow 90-year-old Janey as she writes and directs her latest original, socially relevant community theatre production for her small town. Experience the creative process unfold with a cast of colorful townspeople, as they engage with the arts amidst a local economy devastated by the recent recession. The showcased winning May 10th Hawaii FEAST artist, Boz Shurr along with other participating FEAST artists will be joining the celebration. Talk story session after the film plus ono pupu, libations and music to be had afterwards in the gallery space to enjoy the final day of JuneFEAST Exhibition. PARKING: $1.50/hour metered parking, FREE after 6pm. $4 flat rate after 5p at Chinatown Municipal Garages. As part of the JuneFEAST Exhibition taking place June 1st - 15th at the Arts at Marks Garage Gallery, HawaiiFEAST brings you an afternoon filled with inspiring talk story focused on the idea of public art space activation being a relevant and intrinsic element for healing in our human services sector. Boz Schurr, the featured JuneFEAST Exhibition artist will be joining Child & Family Service providers, Heather Williams, Executive Director at the Art Explorium in Kaimuki and Justyn Ah Chong, Director of Photography for the film Mele Murals to share the valuable and impactful collaborative work being done in community using the gifts of creative artists through public art forms & centers as a powerful tool for resiliency in youth-focused social services. Anne is the Chief Advancement Officer with Child & Family Service, a model nonprofit dedicated to helping Hawaii’s most at-risk families. Its is a family-centered, full-service nonprofit since 1899 dedicated to “Strengthening families and fostering the healthy development of children”. Through nearly 50 programs that welcome everyone from keiki to kūpuna across the Islands, they help Hawai‘i families address some of life’s most serious situations including poverty, abuse, and neglect. Within the past fiscal year (July 1, 2015 – June 30, 2016) alone, CFS provided direct services, to 10,518 individuals and touched another 43,500 lives through phone calls, referrals, educational presentations, and by providing for those visiting walk-in family centers." Boz, originally from Portland, Oregon is currently a graphic design and fine art teacher at Island Pacific Academy and a freelance designer and fine artist. Her works include creating a Student Mural for the Honolulu Museum of Contemporary Art at Spalding House, being a POW! WOW! Hawai'i mural artist artist. You can also find her work in spaces like Mori by Art +Flea, UH Manoa Campus, Island Distillers & even under the Pali Highway! Boz's recent collaboration with Child & Family Services birthed the project, "Hallway of Hope" Commission for their private facilities meant to transform what was once a rather dark and unwelcoming hallway into something magical, warm creating an inviting, peaceful, safe space. Heather wishes she could have gone to a place like Art Explorium as a child, but she is trying hard to make up for lost time as an adult. She is thrilled to work at Art Explorium because it brings together children, art, and environmental sustainability. Heather has helped start two community centers. One was a self-help legal center at the Legal Aid Society of Hawaii. The second was at the Luke Center for Public Service at Punahou School. With her community experience and two young art-lovers of her own at home, working on a community art center for youth is a perfect fit. Born on the island of Oʻahu and raised in the town of Mililani, Justyn is a graduate of the Kamehameha Schools. There he discovered an interest in film production pursuing a Cinematic Arts education at University of Southern California's film school receiving a B.A. in Cinematic Arts and a Minor in Business. Justyn adds to a growing form of indigenous television & film industry where the mission positions his community to attain positive systematic change through media’s potential to engage, entertain and sustain a perspective that is uniquely Hawaiian as the cinematographer for the film Mele Murals which promotes youth development, arts education, cultural preservation, and community-building through the creation of large-scale outdoor murals. Justyn is also a photographer and editor with ʻŌiwiTV as well as a crew member on Hōkūleʻa, documenting his legs of the Malama Honua Worldwide Voyage. June FEAST Exhibition, The Finch Will Flourish Opening pARTy followed by LIVE Dance Concert with Jaramak & Good Foot!! Born from the community support generated at the May 10th FEAST, Boz Shurr, art educator, muralist and illustrator living and working on Oahu, cultivated the JuneFEAST exhibition, The Finch Will Flourish to focus on transforming public and private spaces into places that feel safe and inviting. This show At Marks Garage is in collaboration with Hawaii FEAST to benefit Child & Family Service, which provides safe spaces for transitioning, women, children and families. When finches come into our awareness it is a sure sign of ebullient times ahead. Finches are singers, storytellers and act as omens of changing tides and bright days on the horizon. Birds can also be a symbol of flight and freedom, a colorful transition when darkness turns to light. Through the process of natural evolution, often caused by factors outside their control, some species must struggle, change and consistently build through unpredictable circumstances to find their safe spaces. As they gather their resources they create their havens; their nests and their futures. The work in these murals represent and celebrate this growth change. When the finch sings, it is a beckoning us to unleash our own song. The exhibition runs June 1st-15th and open to the public Tue-Sat 12p-5p. Good Foot has put together this special show to bid bon voyage and good luck to their good friend, Kapono Ciotti, the lead drummer and bandleader for Jamarek. This show is also special because it is happening at the Arts at Mark's Garage and it's on a First Friday! To make the night extra special there will be a view 'teaser' sets of Jamarek drummers and Good Foot horns during the open (and free portion) of the evening from 530-9pm. PARKING: $1.50/hr street parking or FREE after 6pm. Chinatown Municipal Garages $5 flat rate. I’m presenting an idea to hopefully secure some mural funding. Come by and support who you think deserves the support (As long as you’re the supporting the arts I won’t get mad if you don’t vote for me ;) See you there! This fun, interactive mural class allows students to watch their progress as they paint! 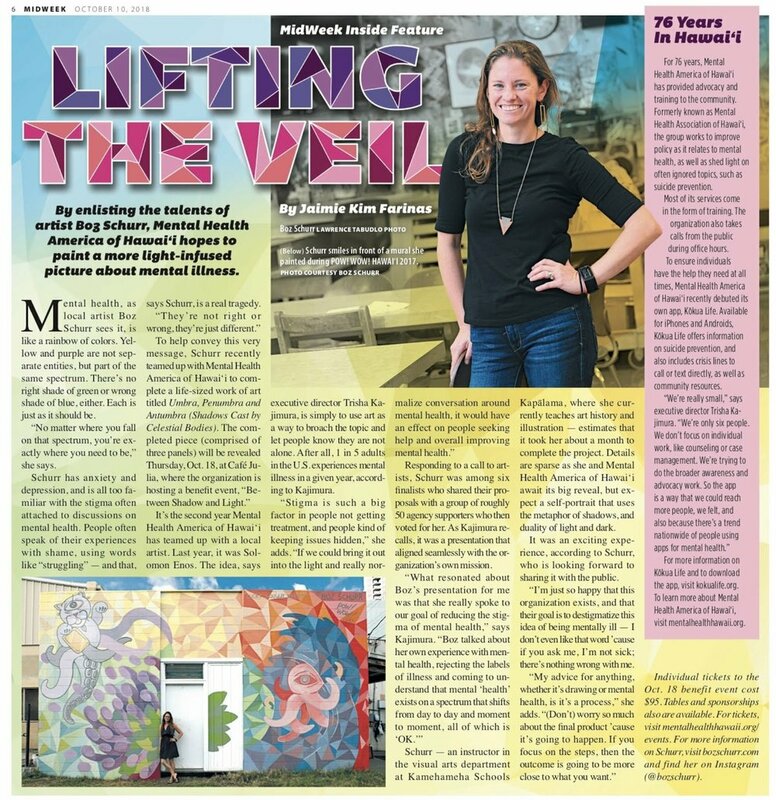 With time-lapse photography and video, students will paint and repaint a large mural and watch it change again and again. Students of all skill levels will enjoy learning to improvise, collaborate, and create this fun time-lapse painting. All supplies are included in class tuition. Although aprons are provided, please wear proper attire—some art processes can get messy! Footwear is required. Parking is FREE in the The Honolulu Museum of Art Spalding House parking lot. You do not need a parking pass. Come check out my amazing National Art Honor Students paint a mural at FIsher! Out of the Office everyone! See you in a little bit!